Sure, we’ll get to all the more glamorous, run-of-the-mill fun stuff that can be had in and around Port Macq… ah lets drop the Macquarie part and pretend we’re all locals eh. Yep, you’ll get to fish, bushwalk, laze about on the sand, hang you’re tootsies off the end of a longboard, spot all the breeds of feathered and furry friends in the mid north, coastal town of Port. If these standard-fare visitor-type relaxation-evoking past times are your deal, then I can assure you, you've stepped off the big number ONE (midway between smoky Sydney and Brisvegas) at just the right spot. If however, you’re keen on seeking out a little more, shall we say weird, or just plain ol’ different preoccupations for a change, then Port should stuff your stockings to the garter belt no probs at all. Your first job is to book into one of the many local van parks for a week, a month, or however long you've got until you need to check back in with the boss, then think long and hard about how exhausted you really want to get. Those with dodgy hips, bung knees or rely heavily on a Zimmer frame will indeed be puffing and feeling the effects of some of these activities, but rest assured, there are plenty of ‘tame’ sights for you to indulge in too. Port, you see, really is a place for all ages! Strolling along the break wall, which runs alongside the Sundowner Breakwall Tourist Park, you'll easily spend a few hours if reading the many arty, witty and funny painted rocks that form the break wall. While it’s not my position to give the thumbs up to add more artwork (it is a form of graffiti), it does seem to be an accepted practice here. There are only a couple (that I could find) of pieces of rock art on this break wall dedicated to the On The Road lifestyle, so how’s about someone put their thinking caps on and come up with something clever to add. Photograph it and email to us for a giggle… but remember, we didn't officially tell you it’s okay to do it! If you’re up for it, be sure to take your skateboard, pushy or scooter for a few sick heel-flips, rail stands or whatever tricks float your boat at the skate park. All the cool kids will know how to tackle the many obstacles within the park, but I’m thinking the more… ummm… mature amongst us will be happy to watch on in amazement of what the latest crop of kids can do. Budding astronomers will seek refuge in the observatory twice a week to check out the future that is held in the stars. Presentations are informative and viewing is top notch given Port is far away from the artificial light-polluting big cities. Learning to surf in Port should be pretty simple if you've got any iota of how to balance on a moving, weaving, wobbly board, as there are some world-renowned local lads that call this pleasurable pastime ‘work’. Their learn-to-surf-schools are a top way to help master the sport and help you get fit at the same time. Casting a line out from the break wall is also a top spot to try for a fresh feed. The water flows pretty fast during tidal movements and there are plenty of rocks to snag on, so be sure you’ve got the right setup. If fishing really is your game, then beach, rock, river and deep sea fishing are all on the cards in and around Port. If you have your own boat, there are a number of boat ramps available from which the open seas are easily accessible. For the smaller tinnies, there are the inland waterways of Lake Innes and Lake Cathie to the south, or the Hastings River to the north. The local newspapers are regularly printing photos of folk who have landed giant Dewies and Flathead so you can be assured there are plenty to go around. If you don’t have your own boat, but feel the need to get onto the water, a visit to the jetties (just near Town Green, the centre of Port and home to one of its major shopping centres, Port Central) will reveal every type of water vessel imaginable; deep sea fishing vessels, sunset tour operators, BBQ boats and, for some reason a Chinese Junk undertakes daily tours – weird but a great alternative. If you’re into cute and cuddly things, then head out to the Billabong Koala and Wildlife Park, which is where the Koala breeding centre is based. You’ll also see snow leopards, kangaroos, cassowaries, monkeys, crocs and various other reptiles. While you’re in the cuddling mood, you’d best drop into the Koala Hospital, where you can get up close and personal with the many injured animals before they are released back into the wild. If its wilderness in the middle of town you want, then a visit to Sea Acres National Park and Rainforest Centre should be on the cards. It’s literally ‘in town’ and boasts Uncle Bill who’ll take you on bush tucker and discovery tours to teach you all about the local aboriginal community. For mine, the coastal walk south from Town Beach is top notch and a must do. It’s a relatively easy stroll along pathways, board walks and beaches with vistas that’ll have the box brownie working overtime. It’s along this walk that you’ll discover one lessor known piece of history I reckon tells an interesting yarn of Ol’ Harry Thompson who decided a patch of sand at Shelly Beach would suit his caravan perfectly and be a great place to call home. Yep, way back in the 60’s, Harry unhitched his van and took residence by the beach and despite a few failed attempts by authorities to move him on, he eventually became the ‘unofficial’ caretaker. Having passed away in 2000 and 40 years of looking after the area, creating the stairs to what was later named Harry’s Lookout and clearing vegetation for all to experience the beauty of the coastal lands, there are now some wonderful reminders of his endless work. Some give you a giggle at how he endured the powers that be, which couldn't shift him, others that are simply remarkable pieces of art to dedicate to an old timer with a passion. The picnic tables and chairs are nothing like you've even seen before; the carved pillars are amazing and the picnic shelter by the beach that takes the form of a vintage caravan is simply brilliant. It’s even got the interior décor (curtains, cushions and decorations) carved into the timber work. Best to drop into Shelly Beach for yourself to have a gander and experience it while munching on fish and chips. Nearing the end of the coastal walk is Lighthouse Beach, which is a worthy spot for a picnic rug and a lay down on the grassy headland to help recover from the long walk, while you chance your luck at spotting whales if the season is right. But, that recovery could be short-lived for those that are still nimble enough to throw a leg over. 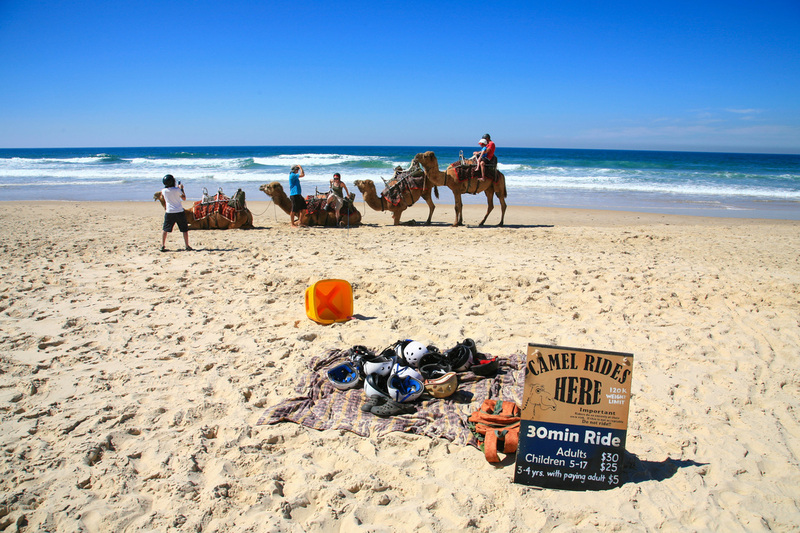 Yep, the single humped camel rides start a few hundred meters along Lighthouse Beach from 9:30am ‘till 1:00pm daily (except Saturdays, which is apparently the camels union picnic day!) and will take you a good distance south along the beach that eventually takes you to Lake Cathie, via some interesting beachside Coffee rock – although the visibility of this rock does depend on recent tides and weather conditions. The bearded cameleer is indeed reminiscent of Ned Kelly and his hairy gang, but rest assured he’s a super-friendly chap ready for a good yarn. If you’re not sure about chancing a bit of camel spit, but still feel the need to suffer from bowed legs, take a drive out to Bellrowan Valley Horse Riding Centre, where you’ll be taken on some incredibly scenic bush trails with inclusive Billy tea and damper. If your backside can handle it, perhaps you can give the two day pub trail tour by horseback a go – not quite sure what the state laws are on drinking and horseback riding are! For those with 4WD’s, there are a number of beaches you can drive on, provided you have the relevant permits. Call the Visitors information centre on 1300 303 155 for more information on obtaining a permit. One 4WD entrance is at Lighthouse beach near the Lighthouse Beach Holiday Village which is just a 100m stroll from the sand. A short drive down the road from this caravan park will take you to a couple of golf courses, who also offer great eating at reasonable prices. While the Birpai Aboriginals are the traditional owners of the area, it was John Oxley, in 1818, that explored the area in its full and gave its current name of Port Macquarie. A year later, he returned on the ship Lady Nelson, of which at times a replica is moored at the wharf at the Town Green. Unbelievably, Port soon became a place of secondary punishment for convicts who had not abided by the laws of their new land. Wow, what a beautiful place to be sent, but perhaps lazing on the beaches was not seen as fit punishment for prisoners! It didn't take long for the powers that be, when in 1830, the Hastings Valley, of which Port resides in, was opened to free settlement. The area did remain a place for lunatics, invalids and special convicts (those that could read and write) for some time, but thank heavens it’s the place it is today for us travelling nomads – even though some may still be lunatics, invalids or special people…nice ones of course! A walk around town will see many historic buildings from our past; of which the Courthouse, Royal Hotel, Wesleyan Chapel, Roto House and the cemetery are just a few. If you are a dedicated historian, you’ll no doubt relish the relics of the region. For those that travel with their pets and find it hard to be accepted into caravan parks, or anywhere for that matter, Port may be ideal for you. Eight out of the fourteen beaches allow pets, many Cafés allow pets to dine outside, and most importantly, many caravan parks will accept you with open arms. Port offers everything you could wish for in a sea-side town…or city as it rightly is. If you should need running repairs to your vehicle, van or motorhome, want ‘big-time’ shopping centres, or just want to escape to the solitude only a long deserted beach can provide, then you’d be crazy not to give this place a go. One big plus that Port offers right from the start is that the main highway doesn’t pass through town – meaning only locals and tourists are on the local roads, not the plethora of semitrailers, passers-bye and other road transport. Having a ‘temperate maritime climate’…ummm… that’s technical official mumbo for ‘it’s a beaut place to indulge in a cold drink and fine food while wearing shorts and singlet’… the Port district also boasts several small wineries, of which chardonnay, Semillon, Merlot and most of your favorites are harvested. Heck, there’s even a couple of local brewing mobs; The Little Brewing Company and Black Duck Brewery who both turn out a great drop of ale – now this is my type of town! Now, the one thing that I reckon tops it all off, is the joint just out of town that you can pick your own Strawberries – Ricardoes Tomatoes and Strawberries happily lets you wander their couple of acres of hydroponically grown plump, luscious, strawberries (and tomatoes) to pick and eat to your heart’s content. Local food from the vines and the ocean, combined with a local drop - how good is that! Your only problem is choosing whether to taste test it in a 5 star restaurant or the seclusion of one of the many beaches. Tuff life here in Port, but, someone’s gotta live it. Might as well be you. Travelling on the Pacific Highway, the turnoff to Port is about five hours north of Sydney (80km north of Taree) or seven hours south of Brisbane (47km south of Kempsey). If you’re heading from the west, the Oxley Highway is the track you’ll be aiming for and Tamworth is the major western town of reference on the map. Once you’re in the main streets of Port, you’ll wonder no more why in excess of 76,000 people now call the area home. As a rough breakdown, the majority of locals are 25 to 44, followed closely by the 45 to 64 year old bracket – just perfect for all you thrill seeking middle aged folk and laid back grey nomads and let’s not forget about the younger set that now have oodles of schooling and after-schooling education to choose from. It seems the joint caters for all age groups! When settled into one of the many caravan parks in Port, there are plenty of day trips to local, smaller towns such as Wauchope (home of Timbertown), the Camden Haven area (Laurieton, Bonny Hills and the like) or even day tripping south to Harrington or Crowdy Bay is an easy affair. While in Port, you can expect temperatures suitable for shorts and T-shirts most of the year round, but you can be assured you’ll need a jumper or someone special to cuddle up to for a couple of the colder months of the year. The area is claimed to have the best climate in Australia, which makes life great for those on the road and wanting an outdoors lifestyle. www.portmacquarieinfo.com.au is the best web site to check all that is on offer.